Charming Charlie, online at charmingcharlie.com, is the go to shop for fashionable jewelry, accessories, and apparel. Charming Charlie offers great deals on earrings, watches, necklaces, charm jewelry, shoulder bags, evening bags, totes, tops, sweaters, dresses, shoes, scarves, hats, gifts, and more. Before shopping at Charming Charlie, be sure to stop by RetailSteal.com for the latest Charming Charlie coupon codes and discount codes. Charming Charlie also offers shipping promos that change often. Visit RetailSteal.com for the latest Charming Charlie shipping specials. Use code at Charming Charlie and save $25 on orders $80+. Use code at Charming Charlie and save $10 on orders $60+. Shop the sale section at Charming Charlie online and enjoy up to 75% off a wide selection of items. 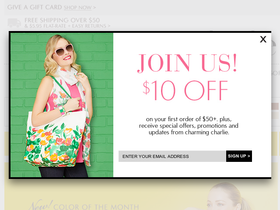 Shop at Charming Charlie and enjoy free shipping on orders $50+.